Enjoy an unforgettable Horses Sleigh Rides with torches in Ojców and Ojców National Park surroundings. Here in Ojców National Park, so close to Krakow you can experience the truly horse sleigh rides with campfire and mulled wine! - Walk to the uins of the castle with a guide - for all souvenir! - The price depends on the number of people willing to walk. Meeting with representatives of EcoTravel in the parking lot below the castle ruin Fathers Casimir. Places 1 sledge for max. 5/6 persons. Duration sleigh ride is approximately 1 hour. The route leads Valley Prądnika: Fathers - Cracow Gate - Gorge Korytania - Fathers. Upon completion of all pending sausage on the grill or bonfires and mulled wine for the adults and for children hot tea. Number of people in a group / Price per person. - It is possible to organize a sleigh ride for smaller or larger groups - price separately valued. Horse Sleigh time can take max. 40 people. For larger groups sleigh ride is organized in rounds. - Route sleigh rides can be changed !!! Catering according to the program. 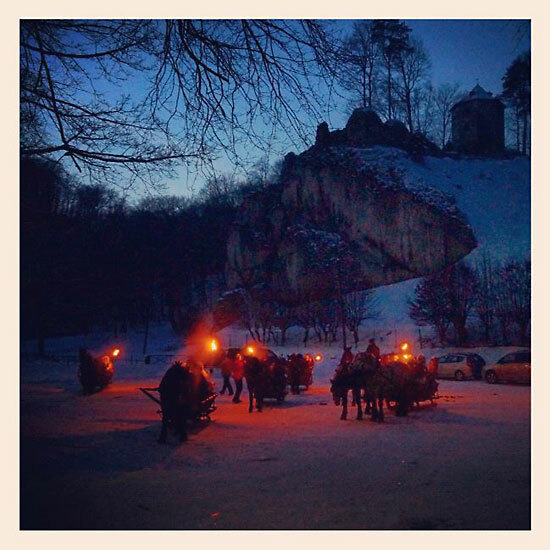 » Sleigh ride with torches.